This one's especially dedicated by students living alone. You might want to bookmark this page, but then again, this recipe is too easy you will probably remember all the steps in one read. Don't we all love easy peasy and tasty lunch from home, that can be made with no fuss and save us some bucks too? As a uni student who currently has no own income source yet, I'm always trying to bring my own lunch, so that the extra money can go to the expensive train ticket. 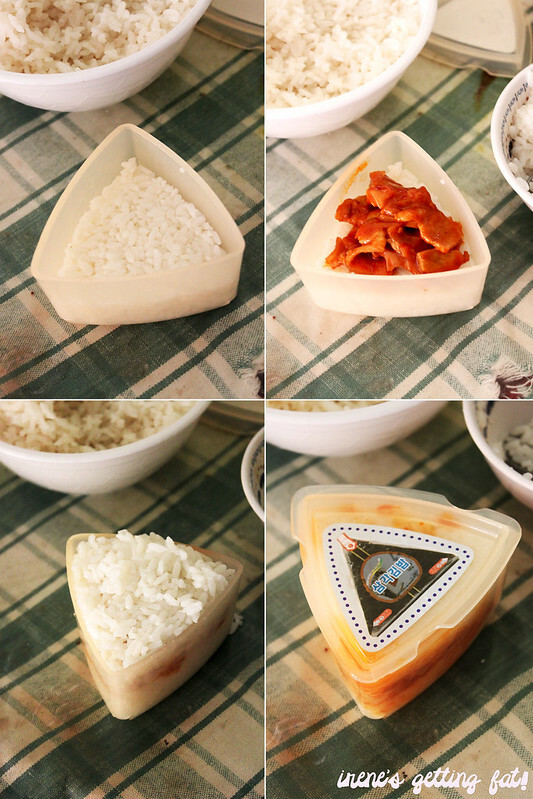 For this reason too, I reckon that my purchase of triangle rice mold from Plus Living is a great investment. 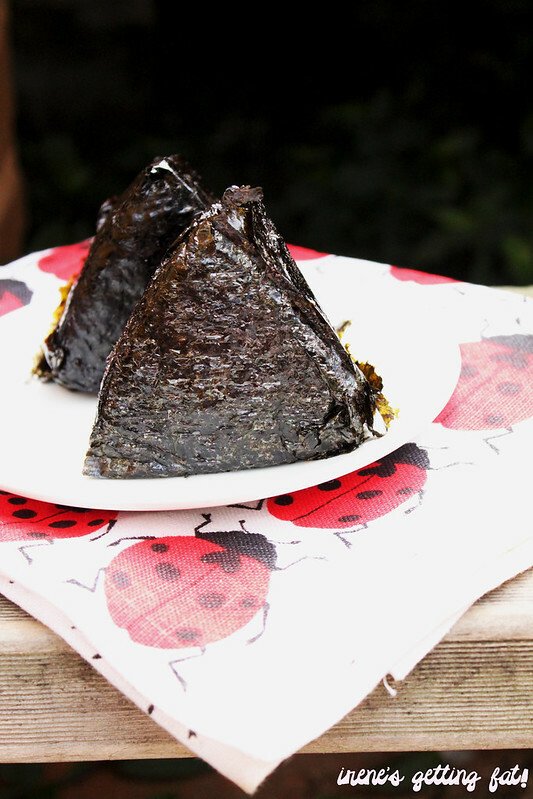 Samgak kimbap (삼각김밥) is Korean triangle-shaped rice wrapped in dried seaweed, which is popular with the name onigiri in Japan. It's usually available in Asian grocery stores; I often grab one or two of these for a quick lunch. This time, I decided to make it myself, with a super easy recipe from Maangchi. Hwowever, I only used the recipe for the rice, because you can make everything for the filling, really. 1. Mix 1 tbsp vinegar, 2 tsp of white sugar, ¼ tsp of salt in a small bowl until the mixture of liquid looks clear. 2. In a large bowl, put 4-5 cups of fresh made warm rice and pour the clear liquid into the rice and mix it and cool down. That is what I did for the rice. The filling, was easy. There was some pork belly in the fridge and I still have my tub of gochujang (Korean chilli paste), so I trotted to the kitchen and made a bowl of very simple stir fried pork with gochujang. 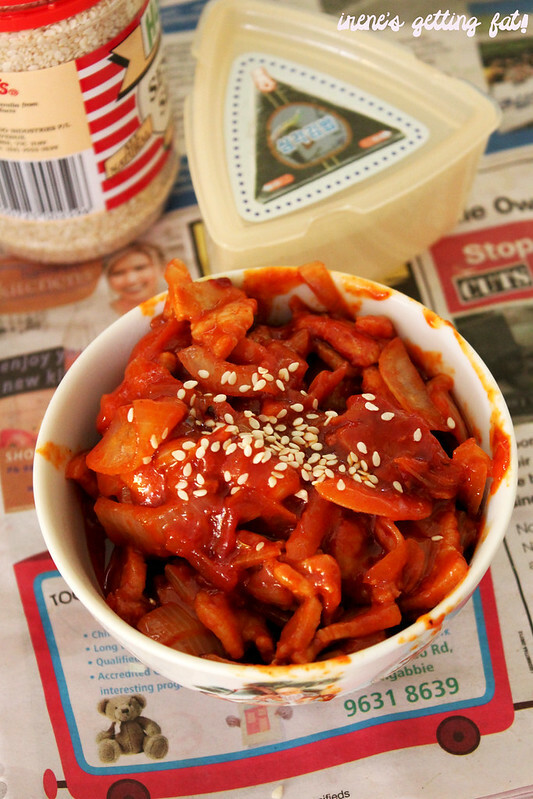 All I needed was chopped pork belly, spoonfuls of gochujang, chopped onion, and pinches of salt and pepper. You won't really need oil because the pork belly is already fatty. The result is savoury and addictive dish that is perfect with warm rice. You can make anything for the filling though, canned tuna, chicken, seafood; anything's possible. And then came the funnest part: molding. Here is where the mess started getting worse. Rice sticking here and there, and my fingers were red due to the gochujang pork. 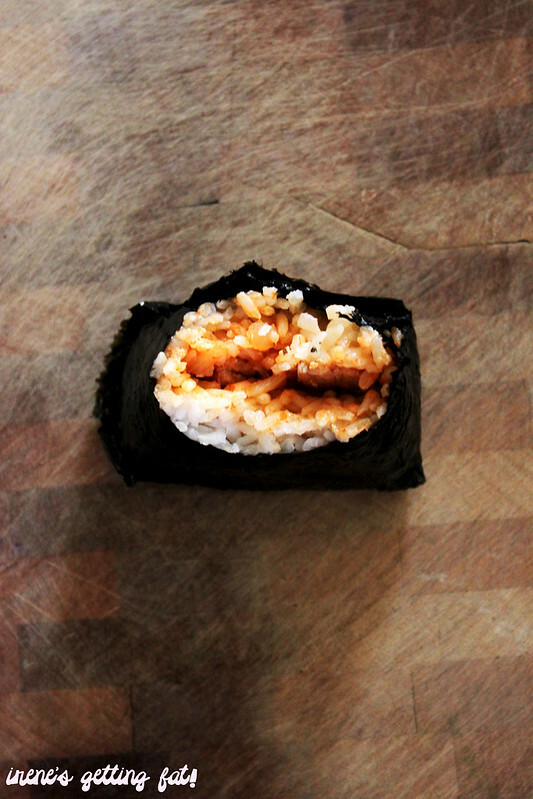 To assemble is simple: a layer of rice, not too much filling layer next, and another layer of rice to finish. Press them all together until it's compact enough. Actually, it may be better to use the packaged seaweed especially prepared for samgak kimbap, but I didn't have any, so I resorted to manual process. The result is a bit messy, but I wasn't going to impress anybody, so that's okay. Flavour wise, my lunch box the next day was probably one of the tastiest and most convenient I've had. The rice isn't as bland as usual, thanks to the sugar, salt, and vinegar, but it's the superb filling that makes most of the difference. The seaweed adds crispy element, although it was already quite soggy by lunch time. Doesn't really matter, though. You can also eat these as snacks, I think they'll be great filler for a few hours. Do you have your fav recipe for your lunch boxes? Do share, I kinda need new inspirations now. Looks good and easy to make. 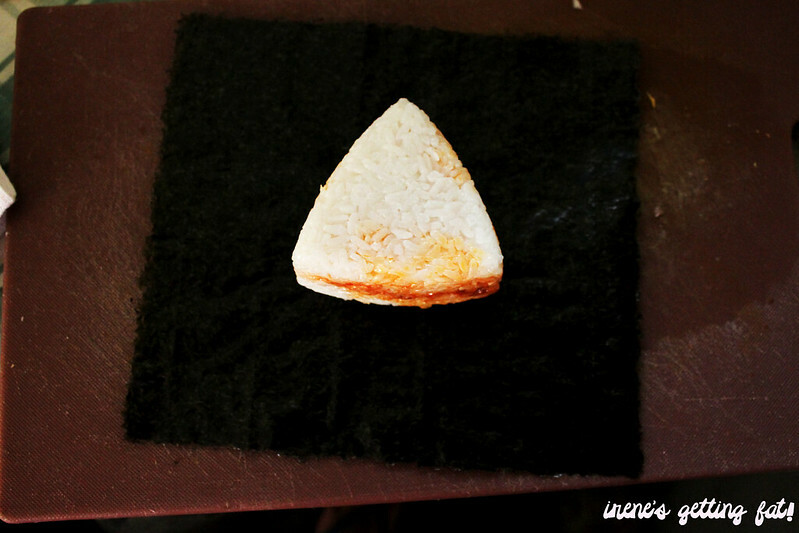 But I gotta have to find that onigiri shape mold. Hehehe. It's easily found on Asian homeware shop. Especially Korean homeware shops! 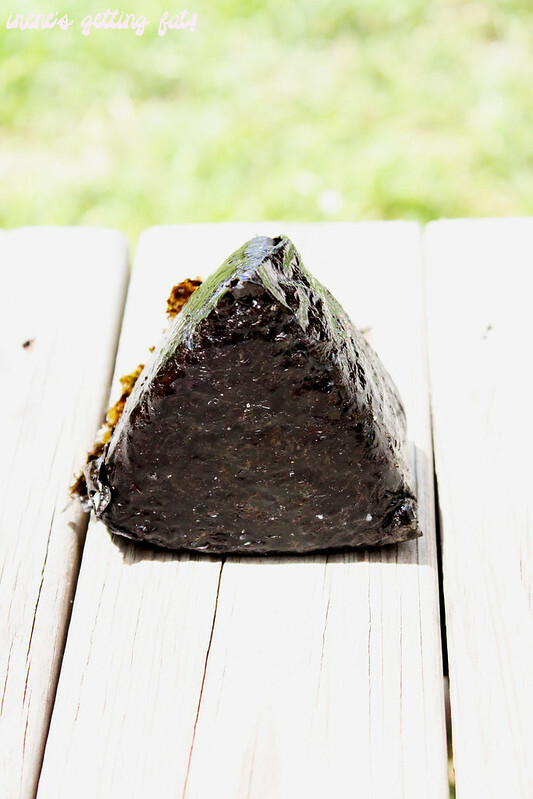 I gotta get myself a onigiri mold! Nice work the samgak kimbap & your filling sounds yum! 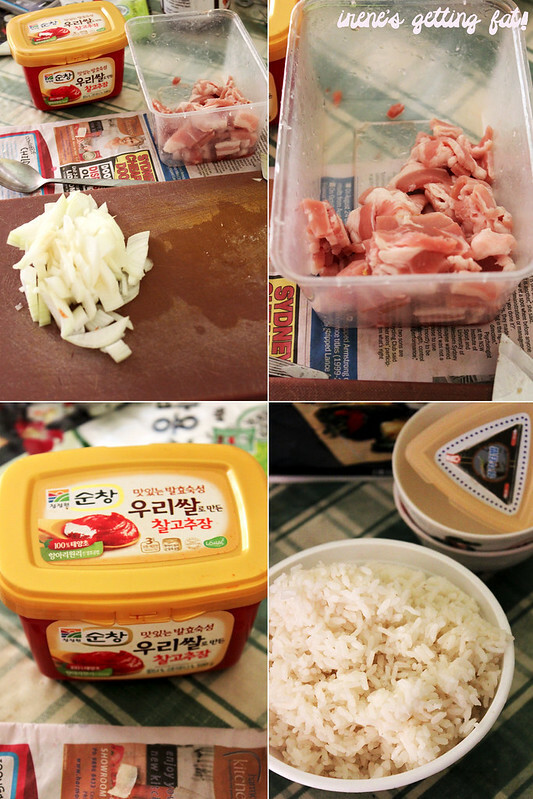 For me, cooking korean dish is way lots easier than Indonesian dish. yah ga inget gw, sekitar 30-40ribuan kalo ga salah sih. Emang lo beli brapaan?